Choosing the right necklace length can be a little tricky, especially when you're shopping online. Fortunately, all it takes to pick the right necklace is a little information about the lengths available. From collars to rope necklaces, there's a length out there that's perfect for your outfit and body type. At about 14 inches in length, collar necklaces lie very close to the neck. Before buying these pieces, it's best to measure your neck to make sure you'll have a comfortable fit. The necklace should be at least two inches longer than your neck circumference. Wear a collar necklace with an open neckline or a strapless dress. This length looks great on petite women. If you are self-conscious about your neck, avoid this attention-grabbing style. Chokers are about 16 inches long, and they rest loosely at the base of your neck. On most people, they hit above the collarbone, but they aren't quite as snug as collar necklaces. A choker is a beautiful style to wear with an open blouse, since it will peek out from beneath your collar. This length also looks gorgeous with other tops that have open necklines, such as V-necks, scoop necks, strapless styles. Like a collar necklace, the choker draws attention to the neck. If you consider you neck one of your best features, give this style a try. At 18 inches in length, princess necklaces are universally flattering. Typically, these chains and strands rest on the collarbone, offering a feminine look for any height or body type. Many pendants come with 18-inch chains, since this is the optimal length to show off a special bauble. This length looks fantastic with any low, open neckline or strapless top. You can also wear an 18-inch necklace over a turtleneck or other high neck. Matinee necklaces can range from 20 inches to 24 inches in length. Depending on your height and the exact length of the necklace, they will hit at the bust or slightly below it. Because they rest on top of the bust or hang just beneath, this can be a somewhat awkward length to wear. In most cases, you can't wear a matinee necklace with an open neckline or strapless top, since it will interfere with the neckline of your clothing. These styles look best over closed button-down shirts, turtlenecks, and other simple clothing options. Because they are a mid-length choice, they flatter most body types. This grand-sounding name refers to any necklace ranging from 26 inches to about 34 inches in length. An opera-length necklace typically falls below the bust and above the waist. Worn over tops and dresses, this style is useful for emphasizing a tall frame. This is a great length for many plus-size women, and it draws the eye to your bustline. Any chain or strand 36 inches or longer is considered a rope necklace. This type of necklace typically fall belows the waist, though 36-inch styles may hit just above the waist on some women. Worn once around the neck, a rope necklace is ideal for taller women. You can wrap the necklace multiple times around your neck to get a variety of looks from this length. Women of all heights can look lovely when they wear a rope necklace wrapped. This style looks beautiful with elegant clothing, since it tends to appear quite formal. Because they create a strong vertical or horizontal line across your body, necklaces need to compliment the height of the person wearing them. In general, women of average height can wear most styles. Petite women often look best in shorter styles, such as chokers and collars. 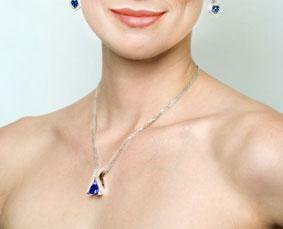 Tall women can wear most styles, but they often look best in longer necklaces like opera or rope styles. A curvy or plus-sized woman can rock a bold look, like an oversized statement necklace or a long rope of pearls. She can also wear delicate pieces in a variety of lengths. If she is self-conscious about her neck, she may want to stay away from chokers and collars. A statement-making necklace can look great on a slim woman, but she needs to be careful not to choose something too substantial for her frame. If the necklace is chunky and fun, stick with shorter lengths to help balance the look. Delicate pieces almost always work as well. If you're shopping locally, take a moment to try on a new necklace before you buy it. That way, you can see if the length is right for you. Even if you're shopping online, you can get a sense of the necklace's fit. Simply cut a piece of string to the same length and hold it in place to see where the necklace falls on your frame. Necklaces come in a wide variety of lengths and styles, and many of them will look great on you. From chunky chokers to delicate opera-length strands of pearls, you can change your look simply by changing the length of your necklace.